"Help! My garage door only opens a couple of inches and stops!" This is another very common problem we hear described by customers. Unfortunately this problem is not usually a do-it yourself fix like the safety photo sensors we talked about in a previous blog post. However, we can talk about how to diagnose the problem so you'll be knowledgeable about the issue when placing a service call. This helps you determine if the problem is related to the door or the motor. 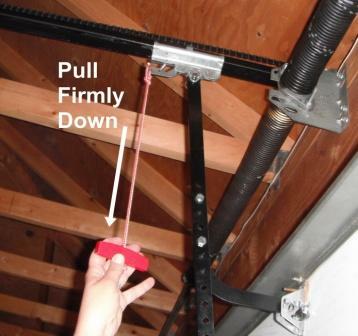 The garage door can be operated manually by disconnecting the garage door opener from the door using the red pull cord. If the door is working properly it should be easy to lift by hand. This indicates that the springs (torsion springs in the case of the photo above) are working properly and are not the issue. 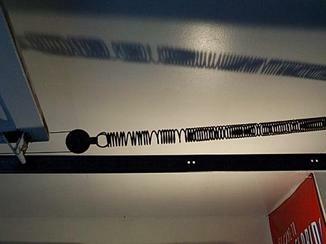 Torsion spring(s): wound up above the garage door with a bar through the center of the springs. 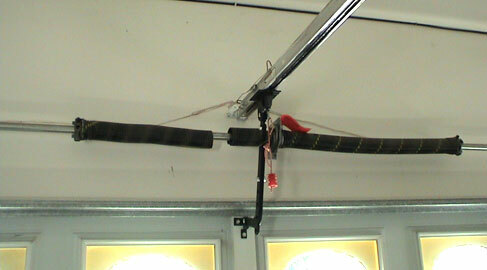 THIRD: If you do see a broken or warped spring call Overhead Door Company of Birmingham. 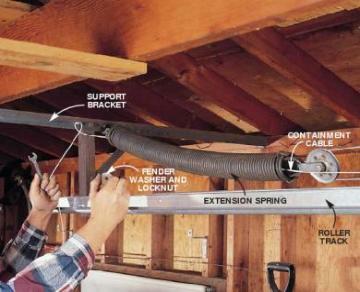 Garage door springs can be very dangerous to work with. We do sell them over the counter but ask that you bring in the old spring when you come so that we can match it exactly. This also shows that you understand how to properly handle the spring(s), although we still have you sign a waiver stating that you understand the dangers involved. Once you begin to identify these springs and see what condition they are in, you should be able to know a little more about why your garage door has stopped working and what type of service is needed to get the garage door working again! Rolling Steel Overhead Door in the Spotlight! "The Auburn equestrian team defeated Georgia, 3-1, in a ride-off competition to win the 2013 NCEA Overall National Championship Saturday at the Extraco Events Center in Waco, Texas." Check out that beautiful Red Ribbon in the background! Many residential and commercial garage door companies try to claim the name "overhead door" to describe their products, but only true Overhead Door Corporation distributors, like Overhead Door Company of Birmingham, can claim the prestigious Red Ribbon logo. Keep an eye out around town for our logo, you might notice it in more places than you'd expect! Read more about the advantages of choosing the Red Ribbon on the Overhead Door Corporation's product page. "Help! My garage door won't close with the remote!" As a service-based company, we have a steady stream of phone calls from homeowners with garage door problems. Surprisingly, one of the questions we hear over and over can be easily handled without a service call. We're glad to talk our customer's through solutions over the phone, so we wanted to share them with you on our blog as well. On December 3, 1992 the Safety Commission published their final rules for Automatic Garage Door Openers. These requirements stemmed from an earlier Congressional mandate in the Consumer Product Safety Improvement Act of 1990. "A Congressional mandate?? What's so serious about an Automatic Garage Door Opener?" you might ask. Well, prior to January 1, 1991 garage door openers were built to reverse if they came into contact with an object when closing. However, the force required to reverse the door varied and sometimes the object in the way was not substantial enough to trigger the reverse. Do you catch my drift here? Kids were getting squished..."in the United States, at least 85 children have had permanent brain injury or have died since 1974 as a result of accidents involving automatic door openers," and that was in 1996! So...The Consumer Product & Safety Act of 1990 required "entrapment protection," which eventually developed into safety sensors, on all garage door openers manufactured on or after January 1, 1991. That brings us back to our initial question. Safety sensors (pictured below) are now installed with all new operators. As you can see, they look like tiny cameras and are mounted on either side of the garage door, inside the garage. Proper installation of photo eyes is three to five inches off the floor. HOW THEY WORK: These safety sensors send an invisible beam across the opening to "tell" the operator whether or not its safe to close the door. In order to create the invisible beam, the safety sensors must be pointing directly at each other - this is indicated by a light on each of the sensors (you can see the faint green and amber lights on the safety sensors shown above). PROBLEM: If the beam is broken, or the sensors are misaligned, the sensor light(s) will go off and subsequently tell the operator not close the door. The garage door may attempt to go down but will come right back up, and the overhead light on the garage door opener will blink. This also disables any remotes or wireless keypads. A good way to see if this is what's wrong with your door is make sure nothing is blocking the door from closing and hold down the wall mounted button inside your garage. This is the override for the safety sensors. The wall button must be held down until the door closes completely. This feature forces the user to stand inside the garage, where they can clearly see that nothing is in the way, before they can close the garage door. This is a temporary fix, let's look at a long term solution. Obviously something large blocking the sensors, like a broom handle, vehicle tires, bicycle, etc. will cause prevent you from closing the door. If this is the case, simply move the object and the door should close. If you don't see anything blocking the door, check for leaves or cobwebs stuck to the sensor. These safety sensors are very sensitive and even the smallest object can break that invisible beam. Simply clean the sensor(s) off and look for the sensor lights to come on again. If you sensor lights have still not come on, the sensors may have been accidentally bumped or kicked, knocking them out of alignment with each other. This breaks that invisible beam, turns off one or both of the sensor lights, and prevents the door from operating with the garage door remote or wireless keypad. To solve this problem, take hold of the misaligned sensor and gently push or pull it until the sensor light comes back on. You want both sensors to show a solid beam of light, a flickering beam could mean that they're almost lined up properly. Once both sensor lights are on, your garage door should be working properly again. If you've tried all of the solutions above and are still having trouble, contact us for troubleshooting help or to schedule a service call.